To achieve a stronger ROI for your Facebook advertising investment, you’ll want to start using Facebook Ads Manager and Power Editor. With Facebook’s diminished organic reach, you’ve probably started leveraging the platform's social advertising features. (And if you haven’t, now is a good time to start!) 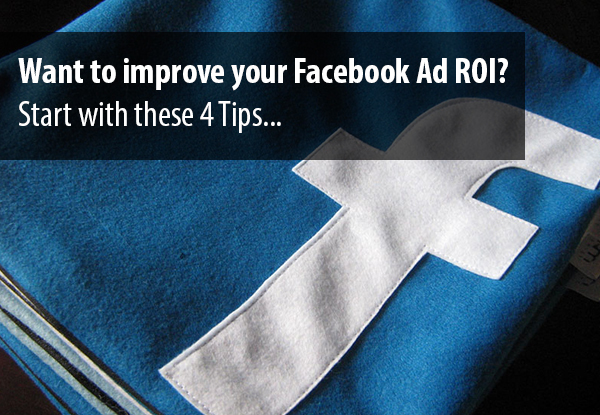 The most well-known among these advertising options is the Facebook “boost post” button. Boost post is okay in an extreme pinch, but it has a lot of limitations. To achieve a stronger ROI for your social advertising investment, you’ll need to let go of 'boost post' and start using Facebook Ads Manager and Power Editor. If you’re new to Facebook Ads Manager, the tool can feel a little overwhelming at first. But once you dig in, you’ll find it pretty straightforward to use, and it delivers far more powerful functionality than the simple boost post button. Page Post Engagement: Increase reach and engagement. Engagement can include likes on your post, comments, shares and photo views. Page Likes: Get more people to like your page. Clicks to Website: Send people to important sections of your website. Website Conversions: Optimize your ad to get people to take specific actions on your website, such as signing up for a newsletter or buying a product. App Installs: Get people to install your mobile app. App Engagement: Get more activity on your mobile app. Event Responses: Promote your Facebook event to get more responses. Offer Claims: Promote timely discounts or other deals for people to claim in your store. Video Views: Increase the number of people who view your video. Now that you’ve defined your ad goal, you’re ready to start designing. It’s important to keep in mind that design guidelines vary across the Facebook ad objectives. For instance, the recommended width for page post engagements is 1,200 pixels with a recommended image ratio of 4:3. But recommended specs for the clicks to website image are 1,200 x 628 pixels. So before you start designing, be sure to visit the Facebook ads guide where you’ll find complete documentation on design guidelines for each of the Facebook ad products. In addition to reviewing the design specs, you’ll also see that Facebook offers a range of additional features and functions based on the ad objective. For instance, certain ads allow you to include a call to action button. If you’re not sure which button to use, or whether to use one at all, you can always split-test your ad to see which option is most effective. Like any well-planned marketing campaign, you’ll want to be crystal clear about identifying your target audiences. The more in depth information you have about your target audience, the more effective your Facebook ad will be. If you have buyer personas in place, this is a great place to start. Your buyer personas will contain valuable background information such as career, education, personal and professional interests as well as demographic data including age, gender, geographic location and more. When you’re ready to define the target audience in Facebook Ads Manager, try to include all buyer persona details that are relevant to your ad. 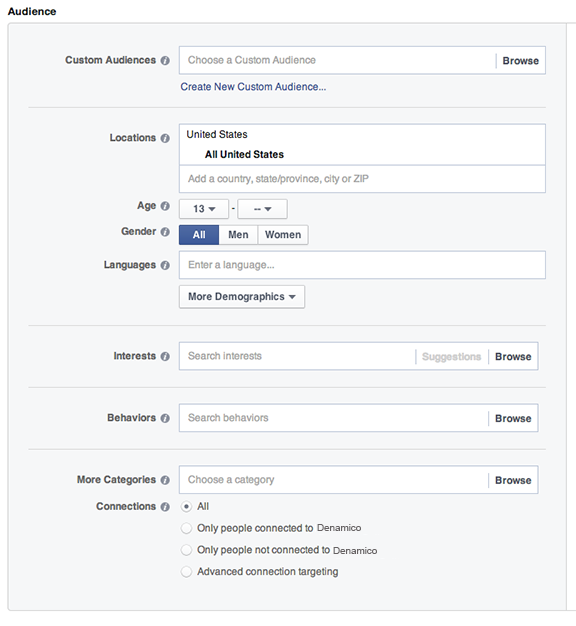 You may be surprised to see exactly how robust your targeting options are in Facebook. 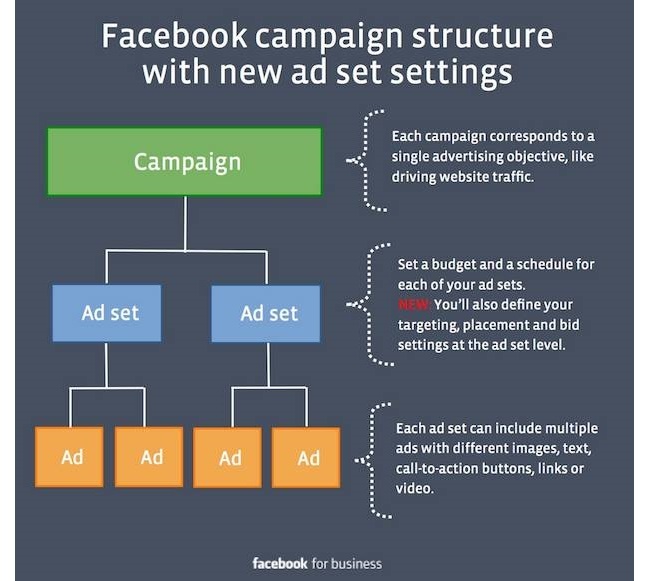 Facebook ads are organized by campaigns. Each campaign corresponds to a single advertising objective like website conversions or page post engagement. Within each campaign, you can have multiple ad sets. At the ad set level, you define the following: budget, schedule, audience targeting, placement and bid settings. Each ad set can contain multiple ads. Within each individual ad, you control imagery, text, call-to-action buttons, links and/or video. Create an ad set for each audience so you can test different audiences. To do this effectively, you should keep all other ad set settings consistent. That way, if one ad set performs better than another, you’ll know it’s because of the targeting, as opposed to another factor such as a higher bid. This will help determine the most responsive audience and reduce the chance of your ad sets competing against each other for the same audience. Create multiple ads to optimize creative. Create a small variety of ads with variations in creative and copy so our system can optimize delivery across the variations in images, video, text or links. Use creative and content that people want to see. Create ads that are relevant to your specific audience, placement and business objective. Review your ad performance and identify the ads with the lowest conversion rates. Consider pausing these ads and creating additional creative variations to test if these variations perform better. Climbing the Facebook Advertising learning curve may seem challenging at first, but it’s well-worth the effort! Once you start launching ads using Facebook Ads Manager (and Power Editor), you’ll never go back to ‘boost post’ again. Have you already climbed the Facebook advertising learning curve? What tips and resources did you find useful? Want to turn Facebook fans into paying customers? Download this ebook to learn the process for increasing your reach to generate leads and close sales through Facebook. Editor's Note: This post was originally published in November 2014 and has been updated for accuracy and comprehensiveness.